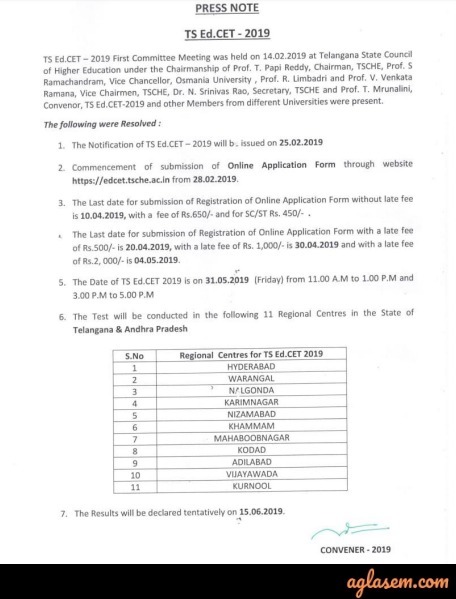 TS EdCET 2019 – Osmania University has released the TS EdCET 2019 Notification on February 25, 2019. 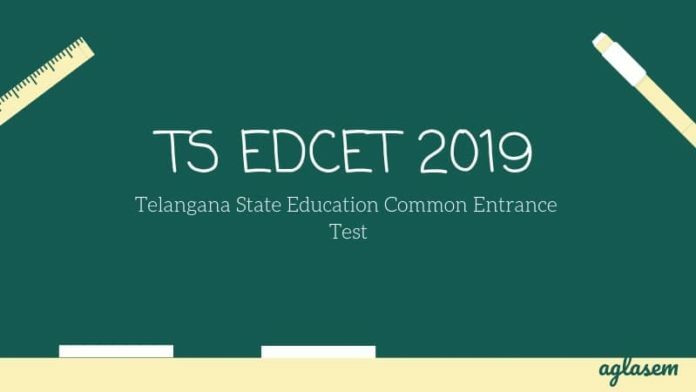 Also, the application form to apply for Telangana State Education Common Entrance Test (TS EdCET) 2019 is releasing on February 28, 2019. This state level entrance exam is for the candidates who wish to seek admission into 2 years B.Ed courses (regular) in the Telangana state. TS EdCET 2019 Exam Date is May 31, 2019. The entrance test is of 2 hours duration. Check details regarding the application process, exam pattern, admit card, counselling etc below. Latest: TLast date of submission of application form for TS EdCET 2019 has been extended. Click here to fill the same. As per the press announcement by the Osmania University, TS EdCET is to be held in the online mode and on one day and 2 shifts. In addition to that, release the application form, application fee and other important dates. 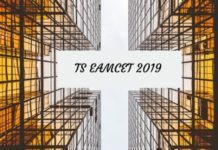 The TS EdCET 2019 exam mode remain online. The exam dates have changed – this year instead of 2 days the exam is being held in 1 day and in 2 shifts. Nationality Criteria: First of all candidate has to be a citizen of India. Bachelors in Engineering or Technology with Specialization in Science and Mathematics with 55% aggregate marks or. However, for candidates belonging to the reserved categories Viz., SC/ ST/ BC and other reserved categories should have secured 40% Marks in the qualifying examination. The candidates who are appearing for the final year degree examination shall also be eligible to appear for TS Ed.CET-2019. As per the GO MS No:13 dated. 27/5/2017, the Candidates possessing MBBS/ BSC (AG) / BVSC/ BHMT/ B.Pharm and such other professional and job oriented degree courses Viz., LLB are not eligible for admission into B.Ed Course. Candidates possessing a Master Degree without having undertaken undergraduate study are not eligible for admission. Age Limit: The candidate should have completed the age of 19 years as on 1st July of the year in which notification is issued. There shall be no maximum age limit. 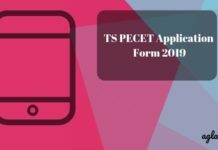 The application form of TS EdCET 2019 is released online only. The candidates after getting through with the eligibility criteria must proceed to fill the application form. Only the registered candidates get to appear in the entrance exam. Also, make sure to keep these details ready before filling the application form – Hall ticket Number of Qualifying Examination, Date of Birth, Caste in case of SC/ST/BC candidates, Study/Residence/relevant certificate for proof of local status and Aadhar Card. The candidate has to visit the official website or can simply click on the above link “Application Form”. The candidate needs to fill up the important details like name, parents name, gender, category etc. The candidate has to make sure that before submitting the details they have to cross-check the details they have entered, to avoid mistakes. The application form is to be submitted only online. The candidate who is applying for the TS EdCET 2019 has to submit an application fee of Rs. 650 for General Category and Rs. 450 for SC & ST category. Payment should be through APOnline /TSOnline Centers in Telangana State or A.P and also through the payment gateway. The TS EdCET 2019 Admit Card will be issued to all the registered candidates to appear in the examination. The admit card will uploaded online at the official website, edcet.tsche.ac.in. No candidates get the admit card via post. It is the sole responsibility of the candidates to visit the official website and download the admit card using their login details. The admit card contains details related to examination like the address of the test centre, date and time to appear in the exam and other important exam hall instructions. The candidates have to preserve the hall ticket/admit card until the admission process ends. The TS EdCET 2019 exam is scheduled in the 11 regional test centres across Telangana and Andhra Pradesh. Mock Test for TS EdCET 2019 is launched for all the candidates. The mock test is provided so that test takers can prepare for the online exam pattern. A login ID & password is given so all you need to do is just visit the official Mock Test and familiarize yourself with the way questions are displayed in Examination. Check out the official Mock Test before appearing for your exam. Click Here to check mock test of TS EdCET. Subjects: Candidates have to appear for General English, General Knowledge, and Teaching Aptitude. However, they can choose any one subject from Mathematics, Physical Sciences, Biological Sciences, Social Studies, and English. The qualifying marks in the Entrance Test for all candidates is 38 out of 150 marks (i.e. 25%). For the candidates belonging to SC/ST communities, there are no qualifying marks for ranking. Questions will be designed to test the ability of the candidate‘s general knowledge of the environment around him and its application to society. The test will also include questions relating to India and its neighbouring countries especially pertaining to History, Culture, Geography, Ecology, Economic, General Policy and Scientific Research. Teaching requires certain characteristics like ability to communicate, ability to deal with Children, ability to recognize individual differences etc., apart from analytical thinking and general intelligence. One who has these characteristics will be able to become a good teacher after training. Questions relating to these aspects will be included to test one‘s teaching aptitude. Part C – Mathematics / Physical Sciences / Biological Sciences / Social studies / English: Out of the 5 available subjects in Part C, the candidates have to select any one subject to appear for the exam. To check the syllabus of Part C and Part A, B as well, Click here. An answer key will be announced by the board after the conclusion of the exams. An answer key is published so that the candidate can check their answers and find out how much chances they have to secure the seat in the exam. There would be preliminary key as well as the final answer key that will have the answers to the questions asked in the examination. The candidate can also have the opportunity to raise the objection against the answer key but that is for the limited time. 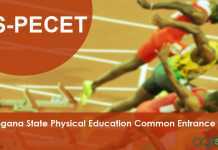 EdCET 2019 will release its question papers and preliminary answer keys, after successfully conducting its entrances across its centres. Candidates will be ranked in each methodology in the order of merit on the basis of marks obtained in TS EdCET-2019 through online examination. A candidate may get the result by entering the hall ticket number on the official website. The result shows the candidate Name, marks, rank, roll number, exam centre and other information. Candidate must take the print of the result for future reference. The counselling for TS EdCET 2019 will be held after the result gets declared and so all the candidates who will clear the written examination for TS EdCET 2019, will have to be present with all the documents for the counselling process. The exact date, time and venue will be updated on our counselling page as soon as we get the complete official details. Candidates will be able to access the counselling section from the “Quick Links” section mentioned above. For more details regarding the TS EdCET 2019, Download Information Brochure. I got 60 marks (in Mathematics )out of 150 and I am non local candidate so can i get admission in any B.Ed colleges in Hyderabad. Plz let me know …. Iam madiha .I was born in aug 1999 and I hold bachelor’s degree ..am I eligible to write edcet in 2019.
i select the Category ST instead of SC. You cannot edit the application try to fill new application form.